Crazy Tetris is unusual clone of the immortal Tetris game. In this game blocks consist not only from squares, but of triangles also. It includes 6 absolutely different variations of the famous game with falling blocks: Simple, Classic, Pentix, Triangularis, Crazy and Mutatix. The object of the game is to maximize your score in placing the falling blocks or triangles into lines. The object of the game is to maximize your score in placing the falling blocks or triangles into lines. Every assembled line that vanishes increases your score. Crazy Tetris supports multilingual interface. If you are Tetris fan, you should try this game and enjoy! 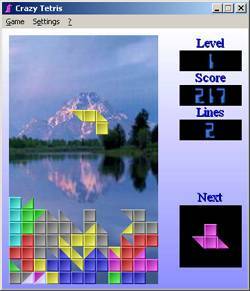 Qweas is providing links to Crazy Tetris 2.21 as a courtesy, and makes no representations regarding Crazy Tetris or any other applications or any information related thereto. Any questions, complaints or claims regarding this application Crazy Tetris 2.21 must be directed to the appropriate software vendor. You may click the publisher link of Crazy Tetris on the top of this page to get more details about the vendor.